Prince Dhruva wishes to rule a kingdom far greater than his father’s. 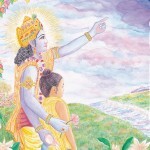 His determination takes him to the forest in search of Lord Narayana, who can fulfill all desires. 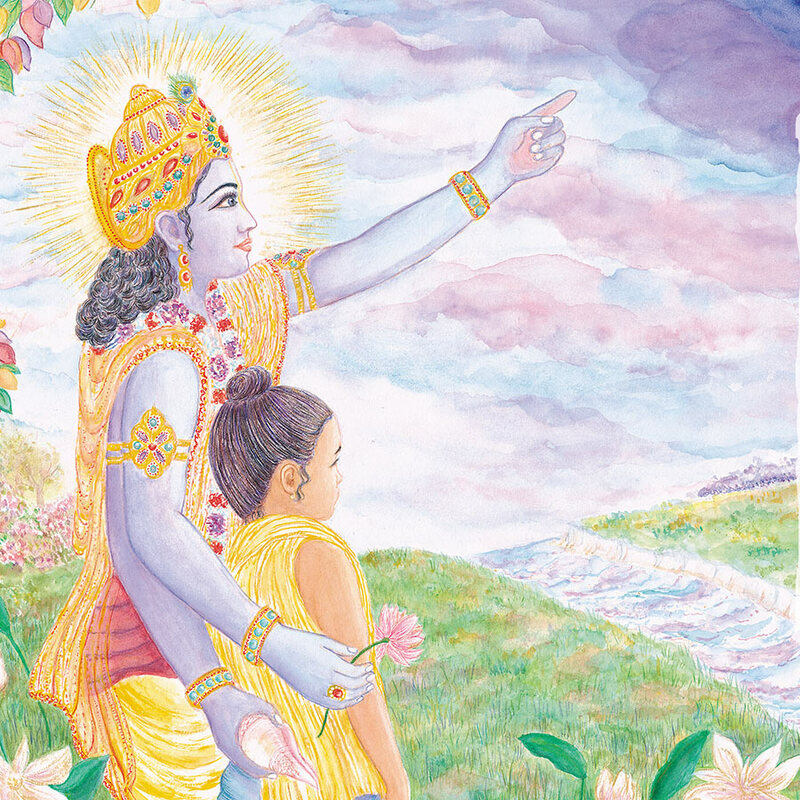 Finding Lord Narayana proves more difficult than the young boy had imagined, but with the encouragement of his new friends and the advice of a mystic sage, the prince embarks on a journey within. After months of penance Prince Dhruva’s prayer and meditation begin affecting the whole universe. Even the denizens of heaven are disturbed. But Dhruva won’t stop until Lord Narayana himself appears. Journey with Prince Dhruva as he learns hope and forgiveness, patience and determination, and in the end is rewarded beyond his greatest dreams. 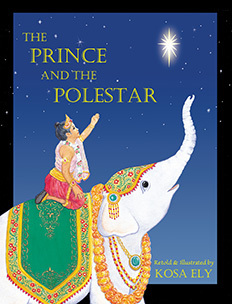 This famous story of Prince Dhruva is presented for the first time in English for children. Charmingly retold and beautifully illustrated with watercolor paintings, the story is full of inspirational lessons for children the world over. Imagine a child, only five years old, leaving home to search for Lord Narayana in a forest filled with wild animals far from home. Prince Dhruva’s passion and purpose make him one of my favorite heroes, and inspired me to tell his story to children around the world. My own children were five and eight years old when I started writing The Prince And The Polestar. Long before it was published they knew the text verbatim. I did the paintings at home, and sometimes to pacify my son, would invite him onto my lap to paint with me. To this day he proudly points out blades of grass and watercolor washes in the book that he painted. On my first visit to Ireland, on a small, remote island in the north, I met a group of children who all had The Prince and The Polestar book. I was an instant celebrity. They surrounded me, asking all varieties of questions. Wanting my undivided attention, they took me on a tour of their island, telling me stories of their adventures. We had a great time. In Auckland, New Zealand, I visited a grade school that had been using The Prince and The Polestar as part of their curriculum for several years. Every child and every teacher knew the book and had read it! “When is your next book coming out?” the teachers asked, impressing on me their need for illustrated books with spiritual themes. To the teachers and the children, (some of whom have their own children now), who have awaited my next book, I can now offer to you The Peaceable Forest, India’s Tale of Kindness to Animals. I hope you enjoy it. The story of Prince Dhruva is narrated by Sukadeva Goswami in the Bhagavat Purana, originally spoken and recorded in the Sanskrit language thousands of years ago. I had the good fortune to first hear the history of Prince Dhruva from His Divine Grace A.C. Bhaktivedanta Swami (Srila Prabhupada). Srila Prabhupada’s translation and commentary of the Bhagavat Purana, known as Srimad Bhagavatam, are the basis of my retelling. Bada Haridas, Bimala dasi, Pranada Comtois, Sudharma, Kristy Tonti, Pani Bhusana, Mohini, Rukmini, Sri Gaurangi, Hari, Devi Deva, Sesa, and Nagaraja. Heartfelt thanks to my kids, who endured my neglect while I wrote and painted. To Harinama Chintamini for her beautiful narration, and my husband for producing the music score and narration CD. And to my spiritual masters, Srila Prabhupada and Narada Muni, who are the source of my inspiration.